Got a cool idea for the signage to be constructed by the Wellington Airport? Here's your chance to have your say by submitting your idea. Wellywood haters who slammed the airport's proposed sign for being uninventive are being given the chance to come up with something better. There will still be a sign - but whether it's Wellywood or something else is now in Wellington's hands. Wellington International Airport is today announcing a public ideas drive and voting scheme to decide what will go up on the Miramar cutting. The process will allow anyone to submit a proposal, so long as it can be built within the $80,000 budget and resource consent restrictions. This is a mission by my favourite group ImprovEverywhere. Love it. Maligayang Buwan ng Wika, James Soriano! Dahil sa Buwan ng Wika ay magsusulat ako ngayon sa wikang Pilipino. Nguni't huwag nyong akalain na tuwing Linggo ng Wika ko lang ito ginagawa. Sa bahay ay pambansang wika ang gamit namin (at paminsan-minsan naman ay nag-i-Ilocano rin kami) kung kaya't nakakaintindi ang anim na taon naming anak nito kahit na nahuhubog ang kanyang utak na magsalita ng Inggles. Gusto namin syang maging bilingual at nang makahalubilo nya ang kanyang mga pinsan kapag nagbababakasyon sa Pilipinas. Masarap bigkasin ang ating wika. Para kang tumutula. Ng mahabang mahaba. At uupo kasi tapos na po. Ang mga bugtungan natin, kay hulaan. At ang ating mga Kundiman ay makababag-damdamin! Kung kaya't hinihikayat ko si Ginoong James Soriano na muling buksan ang kanyang isipan at bigyan ng pagkakataon ang kanyang sarili na suriin ang wikang Filipino sa kanyang makulay na nakaraan. Magbasa ng Florante at Laura, ang Ibong Adarna, mga likha ni Lualhati Bautista. O kaya ay manood ng sarsuela (kung meron pa...) at manood ng pelikulang Pilipino. It seemed only a few days back when we had the unexpected snowfall here in Wellington. 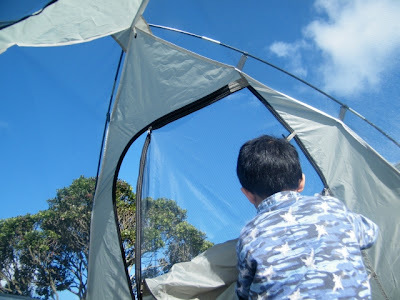 It was a thrilling experience for me and my family. Jo-Lo and I made the most of it because we knew it would not last long. And I did not feel compelled to write right after that. I found new inspiration though, through a couple of books I brought with me from the Philippines after our vacation there last December. It's Dr Juan Flavier's Barrio books which he wrote in the 70s. I will write about that at length in future posts. I was at the bus stop with a couple of commuters waiting for our ride and we were doing small talk when a Metlink car arrived and informed us that the bus was not arriving because the roads were slippery. Dangerous for hilly areas like ours (or on any area for that matter, come to think of it). The other option for us was to walk down to the mall and wait for any other buses at the stop. I remembered though how slippery the road was when I walked to the stop, and I was not about to start a longer walk with my office shoes on (which was a bad idea I guess, but I had a meeting to go to). I did not want to take my chances that morning and the weather forecast was glum for the rest of the day, so I decided to just go home and take the day off. Or rather, do some work at home. So I cancelled my meeting and got some stuff done for the office. By noon, the sun was quite high and the warmth was melting the snow away. So we went out for a bit and had some more photos with our favourite snowman. Even Christine was able to have her photo taken with us! Snow or not, we have work and Jo-Lo has school. 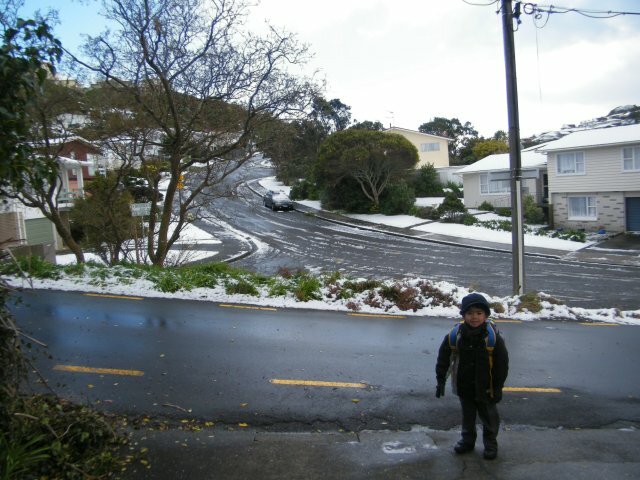 We anticipated the roads to be slippery and so I walked Jo-Lo to school. The roads have been cleared of snow, but it seems we had some rains last night and so some of the snow on the sidewalk has turned to slippery ice, so we walked carefully and slower than usual. I crossed the park enroute to the bus stop and the playground was also covered with snow. 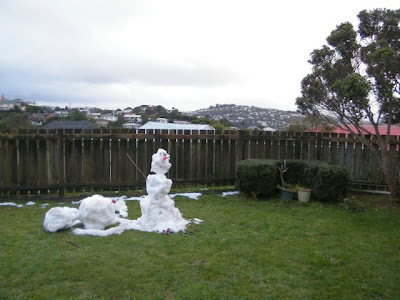 Not that I expected it not to, but at the same time I half-expected it would be gone at this time, because snow is not really commonplace in Wellington. 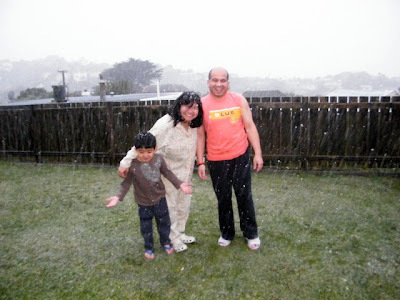 What started out as a drizzle became white, fluffy things that turned out to be snow! It started at around 4:30PM today. 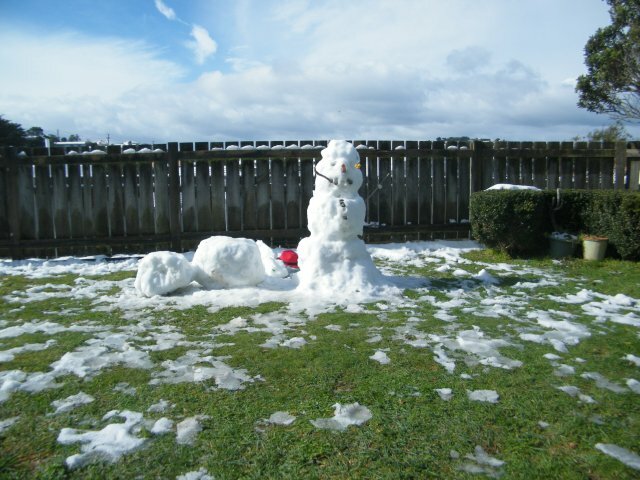 After half an hour we had quite a good layer of snow to create a snowman and have snowball fights! The 6PM news said that this happens only about once in ten years! So we made the most of it and Jo-Lo and I even had a short walk around the neighbourhood while there was still light. What fun! Most unexpected, but a welcome surprise. The snow was just starting at this stage. Oh wow, this is exciting news indeed. The New Zealand Mint will release Star Wars coins! And they're legal tender! Fat chance that we would see any in general circulation. 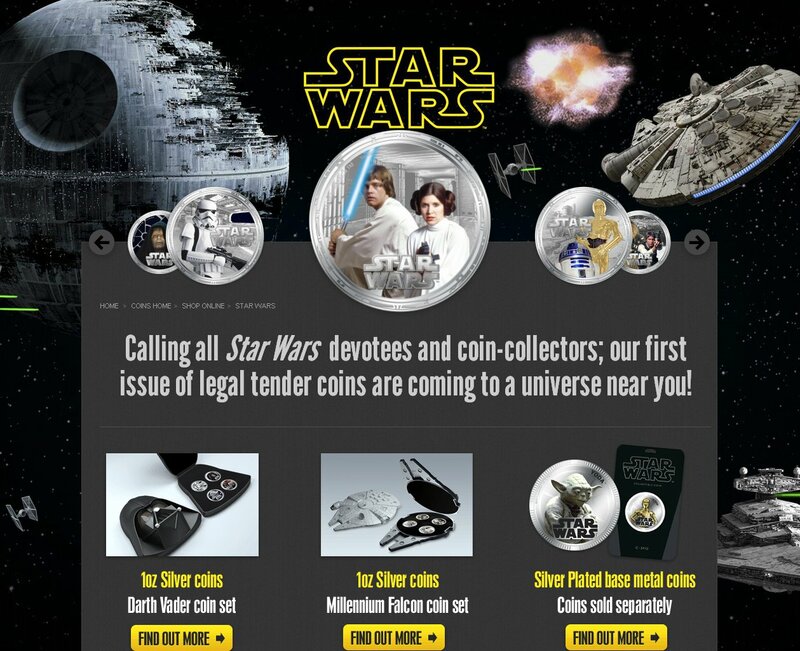 I just might be tempted to purchase a coin... or two. But an entire set would be too much of an investment. It would be so cool though if I can get a set with its custom casing! This is a plea for financial assistance for baby Liam, whose plight has been in focus in the Definitely Filipino blog. A miracle happened yesterday because of all the prayers and the positive force that went Baby Liam's way. It has been a week since the first post asking for support and prayers for a 42-day old baby suffering from severe Pneumonia and Sepsis. I called the Good Samaritan Hospital in Nueva Ecija the other day to check on the baby and was told that Baby Liam is fighting for his life and had to be intubated. It was the baby's 3rd day with a tube to help him breathe when I called. Another post was made to ask for more support, both posts generated an overwhelming response with over 140,000 FB impressions, THANKS to all the DF members who shared the alert and offered their prayers and reinforcement. What is a relaxing weekend for me?